The boss of one of Britain’s largest pub groups is desperate for England to stay in the World Cup for as long as possible. 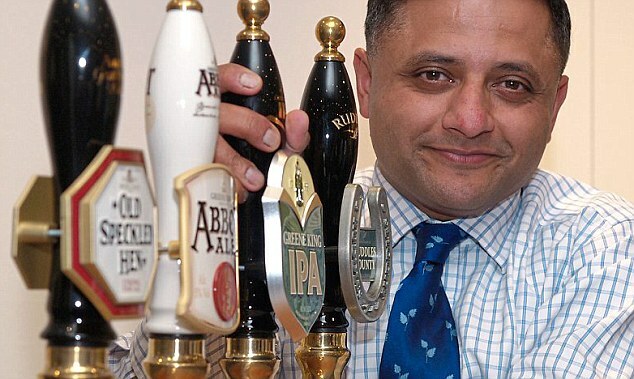 Greene King boss Rooney Anand said the tournament was helping bars bring in extra customers. The company’s results yesterday showed revenue had declined in the year ending in April by 1.8 per cent to £2.2billion, while profit slipped 11.2 per cent to £243million. But its performance had begun to improve in the second half of the financial year, and in recent weeks football has been providing a welcome boost. The network of almost 3,000 pubs sold almost half a million pints of beer and cider during each of England’s first two World Cup group-stage games. He revealed that Greene King had only budgeted for three England matches, so the team’s progression beyond group stages was a bonus for its takings.